A few weeks ago I went to Vancouver for the first time in seven or more years. The last time I was there they had just converted their pedestrian signals from incandescent to LED. The Canadian Walking Man, who takes a longer stride than his U.S. cousin, made the conversion. Last month I saw that Vancouver had changed out all their ped signals again, this time to add a don't walk countdown. 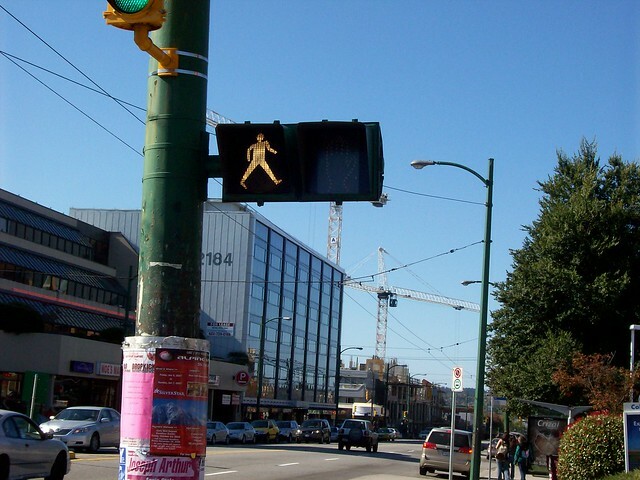 For this project, Vancouver has used generic U.S. ped heads, and the Walking Man is gone. Added safety is nice, but now Vancouver is just a little bit like much of the rest of the places I already visit. As long as they still sell the special Kit Kat bars, it's still worth going. That and being able to walk through different city-scapes. Back in 2006, shortly after I got a digital camera and could take a chance on taking pictures of signals and signs, I got a picture of an incandescent Walking Man, with an unlit LED hand. The incandescent lights were just normal round vehicle signals with pedestrian designs painted on. Here's the same corner now. What special Kit Kat bars? Hershey's got the contract to sell Kit-Kat in the U.S., and they have ruined it. When I shared some Canadian Kit-Kat bars with someone in the states, he said it tastes like old-school Kit-Kat. American chocolate is like American beer, made cheap and tasteless for consumers who want to save a few pennies. The milk chocolate ones taste vaguely the same to me. The dark chocolate ones are better (I brought home some bars as gifts), and there's a lot more overall variety. That said, the green tea Kit-Kats aren't anything to write home about, and I'm not a big fan of orange-flavored chocolate. Vancouver still seems to have lots of Canadian style pedestrian signals, but in lots of other cities there's barely any left (Burnaby and Surrey for example). In some areas, they've been replacing LED Canadian style walk signals (even really new ones) with American style ones without even adding a countdown timer. Most new installations everywhere in BC seem to be American style but every once in a while they'll put up a new Canadian style one. Judging from Streetview, it looks like most of Alberta (except Calgary), Saskatchewan, and Quebec seem to be switching to American style pedestrian signals as well. There's 7000 breweries in the US. ... of which 95 percent make fewer than 465,000 gallons per year and account for less than 4 percent of total volume. Anheuser-Busch Inbev, MillerCoors, Constellation (Corona), Heineken USA and Pabst Brewing represent 81 % of the market share. Typing fast, here: say your typical Calivermwashington craft brewery has 19% of the sales, but 4% of the volume (numbers do not add up, but it's for the demo), it's because their prices are higher per volume compared to the generic horsepisslike liquids. Ergo, American beer is made cheap and tasteless for consumers who want to save a few pennies. Same with mass-produced Canadian beer. Labatt and Molson are Bud and Coors. It's actually quite unusual that there even are distinct Canadian-style traffic signals. Most global cultural regions or continents use the same designs for signals across multiple countries. Labatt and Molson are Bud and Coors. Though I'd take a Canadian any day over Bud or Coors. Unhappy to see those Canadian-special walk signs disappearing. They look more like a white version of the European walking man, than a variation of the American walking man. Yeah I can't figure out what the hell is going on. I figured countdown timers would be pretty standard, but some new installs (by various agencies) don't have them. I think Hwy 1 @ 16 Ave lacks countdown timers, IIRC.